Mary was a half-breed Yamacraw Indian of the Muscogean Tribe whose Indian name was "Coosaponakesee". She acted as interpreter for General James Edward Oglethorpe and was influential in many affairs between Indians and colonists of Georgia. Abijah Collins was designated as a mulatto and "free person of color" on US census records. However, she was actually a descendant of the Tuscarora Indians. She literally purchased her husband, a slave named Solomon, despite the law that prohibited marriage between a free person of color and a slave. Martha was of the Suquamish tribe and was proud to claim an ancestral link to Chief Seattle. She founded the Small Tribes Organization of Western Washington with her own money and was the Suquamish tribal chairman from the late 1920's to the early 1940's. Hepsibeth was the daughter of Lydia Bowman, a Nipmuc Indian, and a white man whose surname was Crosman. She married Jeffrey Hemenway, a Revolutionary War veteran. Hepsibeth cared for indigent women at town expense and worked as a laundress. She is best remembered for her wedding cakes, and for her portrait which hangs in the Worcester Historical Society's museum. Marie Rouensa, daughter of Mamenthouensa, Chief of the Illiniwek Confederation, was so influential was she in the spread of Catholicism down the Mississippi River that, when she died, she was buried under her pew in the church she helped to found nearly 300 years ago. Her life was also of such significance that Duke University included her in their seminars on women who helped to shape the nation in 1999, Ohio University teaches a history course based on her life, and the Illinois State Museum has an entire wing dedicated to her and to her tribe. Sacajawea was the Shoshone woman who, with her French-Canadian husband, Toussaint Charbonneau, joined the Lewis & Clarke expedition. Contrary to popular belief, Sacajawea did not serve as a guide for the party, but was nonetheless of invaluable assistance to them. Boeda, whose Native American name was "Tsi-zak-gay", was the head basket weaver of the Washington State Snohomish Tribe for many years. The last true Ghigau, or Beloved Woman of the Cherokees, Nancy was a very influential woman with both her tribe and the white settlers. She was head of a woman's council which consisted of a representative from each clan as well as an American Revolutionary Patriot. 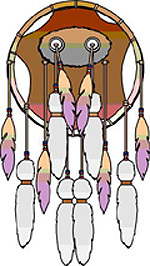 For the most comprehensive Native American genealogical site on the web, visit Native American Genealogy. Dozens of links here to other Native American sites. Return to Notable Women Ancestors.